Senior ushers of the church focused the congregants on prayer and praise while the emergency team performed CPR on a dead man. The visitor Bheka Ntuli from KwaZulu Natal was in town for a family reunion and chose to attend service with some of his relatives. Though details of his condition are unknown to Number1life editors at this time, the situation was serious enough to snuff out his life. In the approximately 20-minute long video, the tension was in the air, as some looked shocked, while others cried, and still more prayed. “They can perform CPR, but only God can give him breath,” said Prophet Major One Bushiri, who was unflinching in his faith during the entire ordeal. 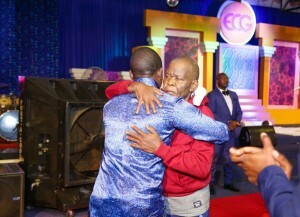 “Let the same breath that you breathed into Adam’s nostrils, breathe that breath into his life right now,” Bushiri prayed, pleading with God to demonstrate his miraculous power. The church exploded with raucous praise, dancing and shouting.